Affordable Doesn't Have to Mean Cheap by Jim Corbran, Automotive Columnist For the past however long it’s been (thank you auto shows) we’ve been showcasing some pretty futuristic and/or high-priced cars in this space. So today let’s go down to the other end of the hallway where most of us actually buy our cars. 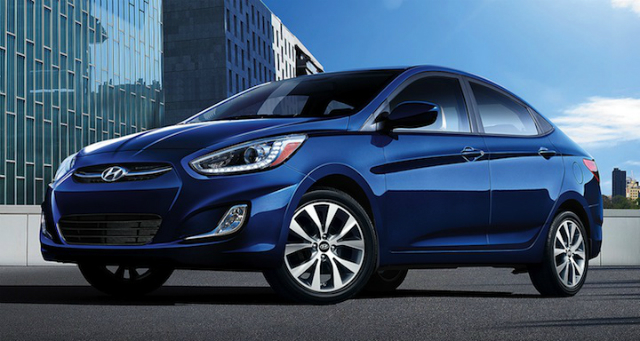 Here’s one of the most affordable cars out there right now, the 2015 Hyundai Accent four-door sedan. It has a starting price of only $14,745 and it’s 1.6L four-cylinder engine, which puts out 137 hp, is EPA-rated at 27/38 mpg city/highway with the six-speed manual transmission (a six-speed automatic is optional). The base Accent isn’t a stripper by any means. Traction control, electronic stability control, and four-wheel ABS are all standard. As are a/c, power windows and locks, 60/40 folding rear seat, tilt wheel, AM/FM/SiriusXM/CD/MP3 audio system with six speakers, iPod/USB and auxiliary input jacks, and Hyundai’s 10-year/100,000-mile powertrain warranty. Okay, the base model also come with 14-inch wheels and wheel covers, rear drum brakes, and a manually adjustable driver’s seat. Is that really a problem? For a new car which will fit a family of four (five if they’re friendly), their stuff (the trunk holds almost 14 cu. ft.), and which has one of the best warranties in the business — I think not. You can see more for yourself at hyundaiusa.com ### Jim Corbran, Automotive columnist for Artvoice Read You Auto Know every other week in Artvoice, and check the YAK blog daily here: http://blogs.artvoice.com/avdaily/category/you-auto-know/ The post AFFORDABLE DOESN’T HAVE TO MEAN CHEAP appeared first on Buffalo Cars.